Perched upon the banks of the mighty Zambezi, the Victoria Falls River Lodge boasts 13 luxury safari tents – with the emphasis on luxury – overlooking one of the world’s most famous rivers. Sheltered by a thatched roof and tastefully decorated in earthy hues, calling these accommodations “tents” hardly does them justice; think plunge pools, king-plus beds, private viewing decks and indoor and outdoor showers, all just a stone’s throw from the eponymous (and undeniable) falls. Those who want to spend their days on safari and adventuring around the Falls, and their nights indulging in world-class style and comfort. Most Memorable Moment? Standing on the lodge's boardwalk and watching the mist rise up from the falls is something I'll never forget. 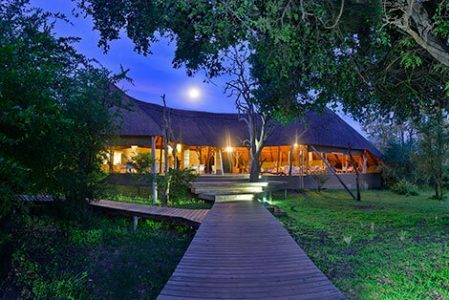 Victoria Falls River Lodge is located within Zambezi National Park, adjacent to Victoria Falls National Park. The closest airport is Victoria Falls Airport, about a 45-minute drive from the lodge. The Lodge offers shuttle services between the airport and the Lodge, along with daily trips into the town of Victoria Falls. The lodge offers multiple ways to explore the rugged terrain, impressive wildlife and (of course) majestic wonder of the falls themselves. 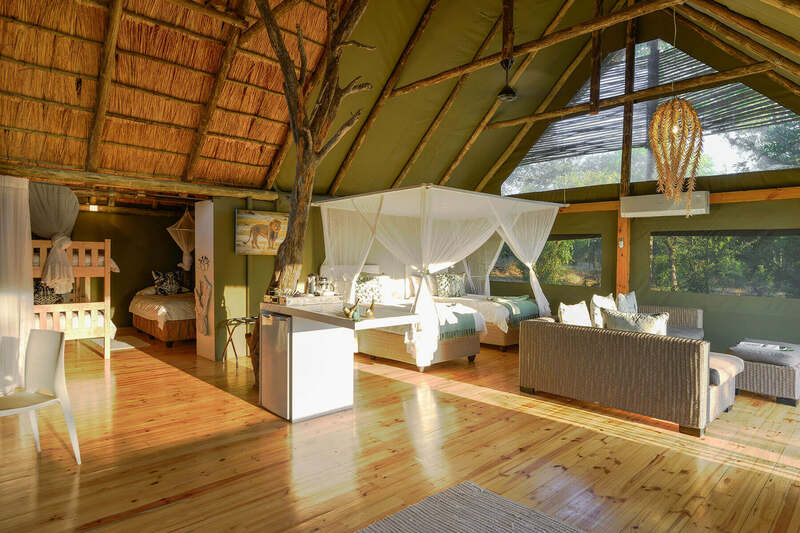 Victoria Falls Lodge offers eight luxury tents and five luxury family suite-tents, each with thatched roofs, private decks and a plunge pool. These luxurious thatched tents are well spaced and air-conditioned. Constructed of canvas, glass and wood each extends out onto a private deck with its own plunge pool and boasts uninterrupted panoramas of the Zambezi River and natural bush. Stylish and spacious, the 1,180 sq. ft. rooms are a fascinating fusion of European and African décor, with clean lines, soothing hues and a fresh, earthy feel. 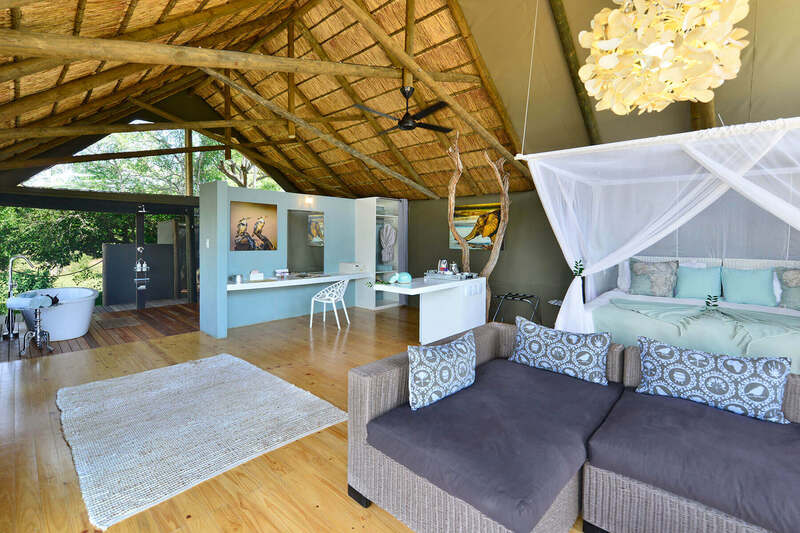 All Luxury Tents offer a larger than king size bed, comfortable sitting area, open plan bathroom with freestanding bath and both indoor and outdoor showers. Twin bedded sleeping configurations are also possible. Family Suites offer an adjoining tented room, with one single (three-quarter sized) bed and one bunk bed, where up to three children younger than 17-years-old can sleep comfortably. Like the Luxury Tents, the Family Suites also have a private deck and plunge pool, but offer more square footage (1,200 sq. ft.) and the opportunity for parents to have a bit of privacy while the kids are only an arm’s length away. Looking to extend your adventure? Discover a few ways to weave Victoria Falls Lodge into an even grander journey.